The DIRAC program computes molecular properties using relativistic quantum chemical methods. It is named after P.A.M. Dirac, the father of relativistic electronic structure theory. 2018-12-12 DIRAC18 is here !! A novelty this year is open access through the zenodo repository; you can get the source by a smiple click on the above link. All users are most welcome to join our mailing list. 2018-06-18 Lucas Visscher has been elected member of the International Academy of Quantum Molecular Science. Congratulations, Luuk !!! First row: Erik Kjellgren, Odense; Ayaki Sunaga, Toulouse; Yongliang Hao, Groningen. Second row: Martin van Horn, Amsterdam; Pi Haase, Groningen; Andre Gomes, Lille. Third row: Hans Jørgen Aa. Jensen, Odense; Trond Saue, Toulouse; Tjerk Straatsma, Oak Ridge. From left: Loic Halbert, Lille; Radovan Bast, Tromsø; Eugene Gvozdetsky, Amsterdam; Gosia Olejniczak, Warsaw; Miroslav Iliaš, Banská Bystrica; Luuk Visscher, Amsterdam. 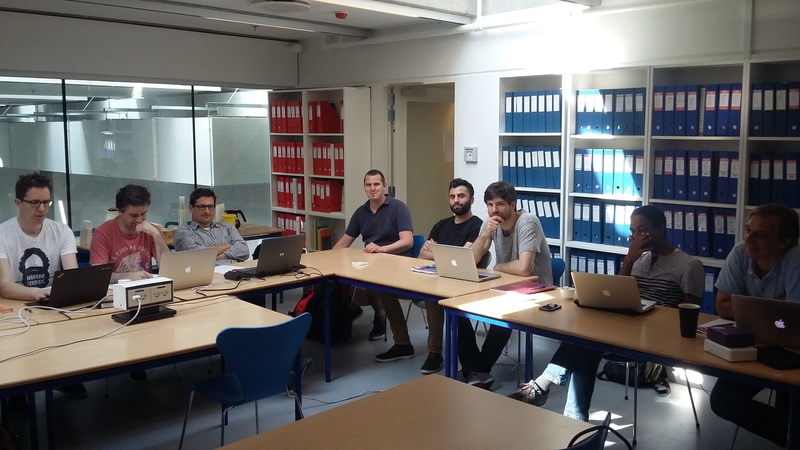 2018-05-28 The 21th DIRAC meeting has started on Odense. 2017-12-12 DIRAC17 released. We are happy to announce the release of DIRAC17, the latest version of the DIRAC code for 2- and 4-component relativistic molecular electronic structure calculations. New features are found here. Get a DIRAC17 license here. 2017-09-06 DIRAC17 was announced at the 12th International Conference on Relativistic Effects in Heavy-Element Chemistry and Physics (REHE2017) in Marburg. The release date will be Dec 12 2017. Stay tuned ! 2017-06-09 DIRAC meeting 2017, June 6th - 9th, Odense, Denmark. From left: Hans Jørgen Aagard Jensen (Odense), Trond Saue (Toulouse), Erik Hedegård (Lund), Morten Steen Nørby (Odense), Radovan Bast (Tromsø), Lucas Visscher (Amsterdam), Paul Bagus (Denton), Markus Pernpointner (Heidelberg), Eugene Gvozdetsky (Amsterdam), Benjamin Helmich-Paris (Amsterdam), Andre Gomes (Lille) and Elke Fasshauer (Copenhagen). 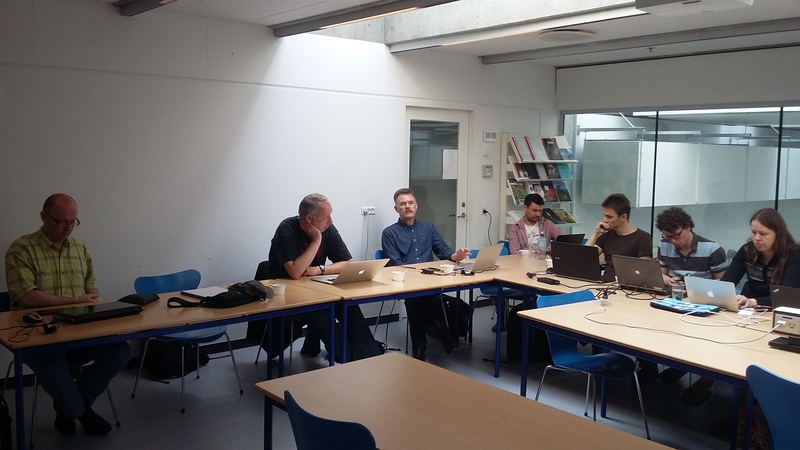 2016-06-06 The 20th DIRAC meeting has started on Odense. From left: Andre Gomes (Lille), Eugene Gvozdetsky (Amsterdam), Markus Pernpointner (Heidelberg), Luuk Visscher (Amsterdam), Elke Fasshauer (København), Benjamin Helmich-Paris (Amsterdam), Hans Jørgen Aagard Jensen (Odense) and Paul Bagus (Austin). 2017-05-07 P.A.M. Dirac in College Street Coffee House in Kolkata 1954-55. From L to R : Tapen Roy, Prof. S.N. Bose, Prof. P.A.M. Dirac, Prof. Gagan Behari Bandopadhyay, and Purnima Sinha. 2016-12-12 DIRAC16 released. We are happy to announce the release of DIRAC16, the latest version of the DIRAC code for 2- and 4-component relativistic molecular electronic structure calculations. Get a DIRAC16 license here. 2016-05-31 DIRAC16 will be released mid-November. Stay tuned ! Meeting dinner. 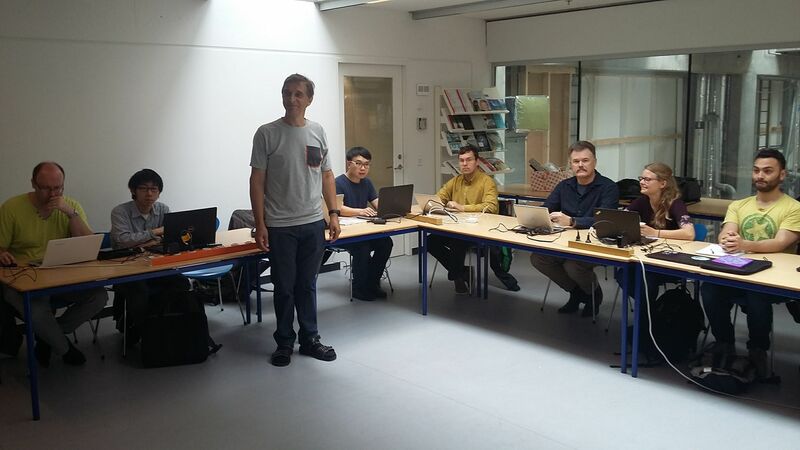 From left: Stefan Knecht (Zürich), Trond Saue (Toulouse), Ben Helmich-Paris (Amsterdam), Ismail Aydin (Amsterdam), Stanislav Komorovsky (Tromsø), Avijit Shee (Lille), Luuk Visscher (Amsterdam), Michal Repisky (Tromsø), Hans Jørgen Aagaard Jensen (Odense), Markus Pernpointner (Heidelberg), Elke Fasshauer (Tromsø), Andre Gomes (Lille), Radovan Bast (Tromsø) and Tjerk Straatsma (Oak Ridge). 2016-05-29 The 19th DIRAC meeting has started on Odense. 2015-12-17 DIRAC15 released. We are happy to announce the release of DIRAC15, the latest version of the DIRAC code for 2- and 4-component relativistic molecular electronic structure calculations. Get a DIRAC15 license here. 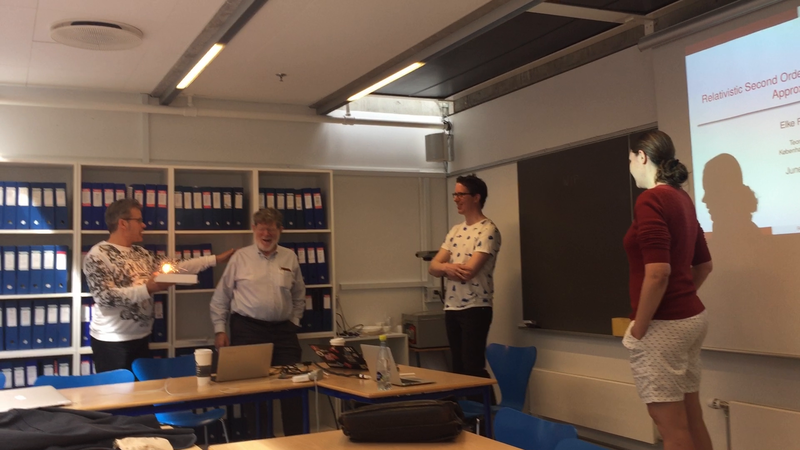 2015-08-24 The three-day conference "Open Shells, Open Questions", celebrating the scientific achievements of DIRAC author Hans Jørgen Aagaard Jensen, starts today in Middelfart, Denmark. 2015-07-20 DIRAC14.1 patch is out. 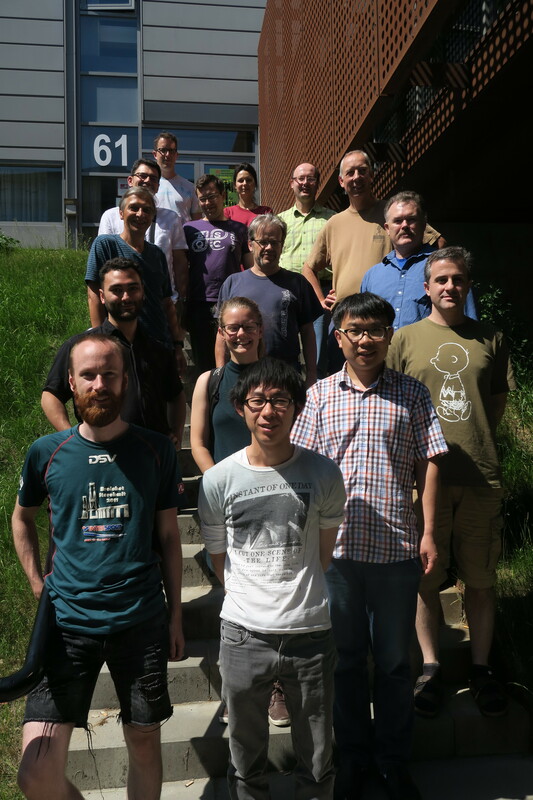 2015-05-09 DIRAC meeting 2015, May 06th - May 11th, Odense, Denmark. 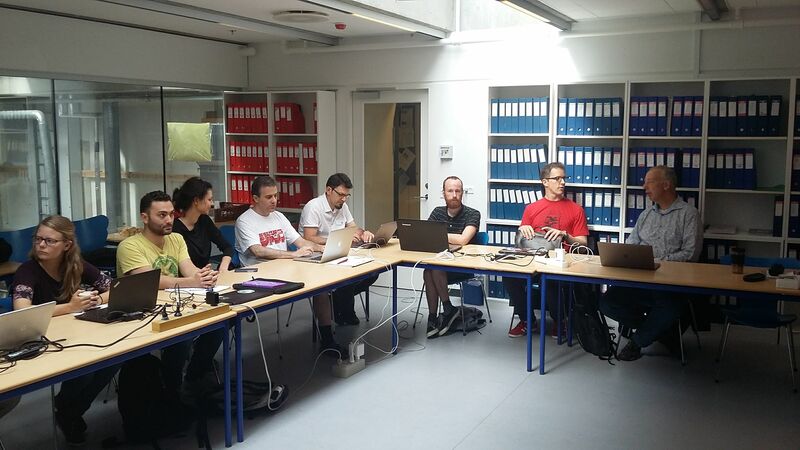 2015-5-8 The annual DIRAC developer meeting is in progress. As usual kindly hosted by SDU in Odense. 2015-4-10 New Paper: E. Fasshauer, P. Kolorenc and M. Pernpointner, Relativistic decay widths of autoionization processes: The relativistic FanoADC-Stieltjes method J. Chem. Phys. **142**, 144106 (2015). 2015-4-09 DIRAC authors Ephraim Eliav and Uzi Kaldor in Nature. Measurement of the first ionization potential of lawrencium, element 103. T.K. Sato et al., Nature. 520 (2015) 209–211. 2015–3-02 New Paper: Malika Denis, Morten N. Pedersen, Hans Jørgen Aa. Jensen, Andre Severa Pereira Gomes, Malaya K. Nayak, Stefan Knecht, and Timo Fleig, Theoretical Study on ThF+, a prospective system in search of time-reversal violation New. J. Phys. 17 (2015) 043005. 2014-12-12 DIRAC14 released. We are happy to announce the release of DIRAC14, the latest version of the DIRAC code for 2- and 4-component relativistic molecular electronic structure calculations. The date has been chosen to mark the 81th anniversary of the Nobel lecture given by P. A. M. Dirac, Dec 12 1933. New features are listed here. Get a DIRAC14 license here. 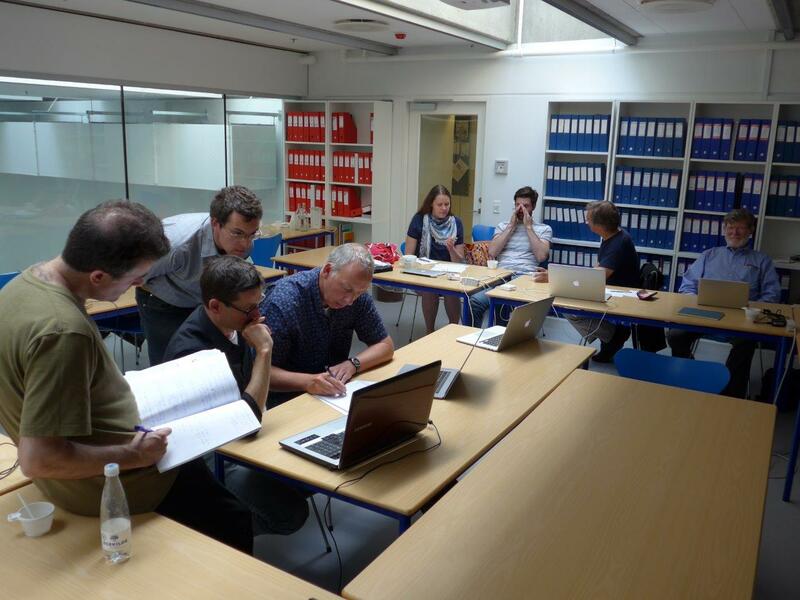 2014-06-29 DIRAC meeting 2014, June 28th - July 2nd, Odense, Denmark. 2014-06-28 DIRAC meeting has started. 2014-06-02 DIRAC13.3 patch is out. 2014-04-14 DIRAC13.2 patch is out. 2014-01-22 New paper: Stefan Knecht, Örs Legeza and Markus Reiher, Communication: Four-component density matrix renormalization group, J. Chem. Phys. 140 (2014) 041101. 2013-12-16 DIRAC13.1 patch is out. 2013-12-12 DIRAC13 released. We are happy to announce the release of DIRAC13, the latest version of the DIRAC code for 2- and 4-component relativistic molecular electronic structure calculations. The date has been chosen to mark the 80th anniversary of the Nobel lecture given by P. A. M. Dirac, Dec 12 1933. Get a DIRAC13 license here. 2013-07-03 DIRAC meeting 2013, July 1-5, Odense, Denmark. Front row: Elke Faßhauer (Heidelberg), Carlos Gimenez (Corrientes), Markus Pernpointner (Heidelberg), Trond Saue (Toulouse); Second row: Hans Jørgen Aagaard Jensen (Odense), Anatoly Titov (St. Petersburg), Mickael Hubert (Toulouse/Odense), Malgorzata Olejniczak (Toulouse); Back row: Lucas Visscher (Amsterdam), Stanislav Komorovsky (Tromsø), Erik Donovan Hedegård (Odense), Andre Gomes (Lille), Michal Repisky (Tromsø), Avijit Shee (Toulouse), Radovan Bast (Stockholm). 2012-12-12 DIRAC12 released at 12:12:12 CET. Get a DIRAC12 license here. 2012-09-14 Radovan Bast announces the release of DIRAC12 on 12/12/12 at the 10th conference on “Relativistic Effects in Heavy-Element Chemistry and Physics”, REHE-2012 in Corrientes, Argentina. Stay tuned for the official release announcement !! 2012-06-18 DIRAC meeting 2012 in Odense June 17-21. Hosting for this website is kindly provided by the Matej Bel University, Slovakia. Suggestions/questions/comments about this website? Please write to Radovan Bast (firstname.lastname@uit.no).